Our outdoor labels and stickers are waterproof, fade resistant, oil, solvent resistant and built to stand up to the wear and tear of commercial, retail and industrial application. Add a laminate to create a very heavy duty outdoor labels solution. Reverse printed for inside glass application. Available as rolls or sheets. Our outdoor labels and stickers are made specifically to withstand industrial, commercial and retail environments. Outdoor labels and stickers are made from materials and inks that will withstand the elements. Our outdoor products come with up to 7 years UV resistance. Apart from not fading, they are also waterproof, oil and solvent resistant and scratch resistant, so you can also be assured that our products will stand up to things like rain, dirt, cleaning and even high pressure washing. This also means they are the perfect product for packaging of oils and cleaning products and for all statutory and safety equipment stickers. These outdoor labels and stickers are put to the test on a daily basis and yet stay looking good. 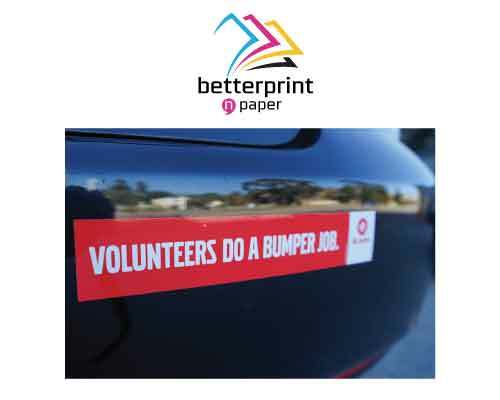 Betterprint n’ Paper don’t give preset pricing online, talk to us about your specific requirements and we can work with you to get the best price point for your requirements.